The Drop C tuning is mainly used in heavy metal and can give you a real heavy and bassy sound. A useful device to implement together with this tuning is palm muting. 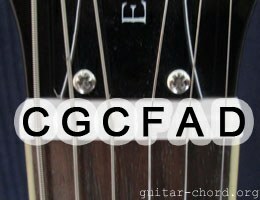 Here is how you tune the guitar: CGCFAD. (see also CADGBE Tuning) From standard tuning you tune down the lowest string two whole steps and when one whole step for the rest (see the picture). It is very important that you turn the tuning pegs in a direction that decrease the string tension and not the opposite; otherwise, it is a great risk you break the strings and possible damage the guitar. The chords above demand obviously not much. You could see the similarities to normal power chords and you should also in a high degree use them in a similar way. An interesting thing is that you can play barre chords as normal, despite the changed tuning, and they will sound good. In some cases, it will also sound good and slightly different from normal with open chords. Since five of six strings have been change with the same proportions (one tone down), it will still sound pretty much as usual, but slightly different. Try for yourself and see. Related to Drop C tuning is the CADGBE tuning. Notice that only the bass tone is tuned different from standard tuning in the latter case. Sometimes CADGBe is also referred to as Dropped C tuning. Since only the lowest string differs from standard tuning, many open chords could be played just as normal, but you could also choose to use alternatives like the D major and D minor in the diagrams above. This was an introduction about chords in drop C tunings, see also Drop D tuning.